"Bulgaria Puzzle " is a free online knowledge level game to drag and drop the Bulgarian regions in their correct places. Sort the provinces of Bulgaria in Bulgaria map online puzzle. Each puzzle piece is a different province, with that state's name and flag. 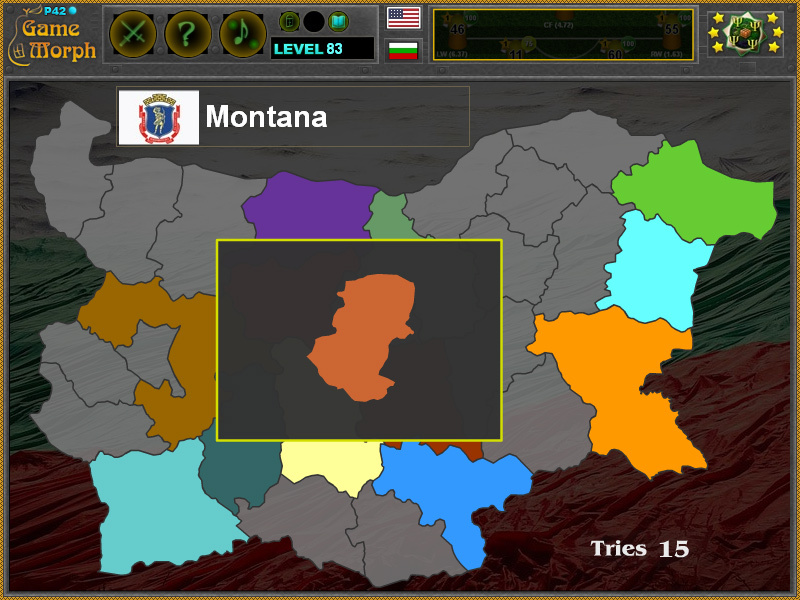 Free online game to explore and study the provinces and flags on the map of Bulgaria. Geography game, suitable for online lessons and interactive classes. Minute to win it game. Identify all 28 provinces by size, shape, and location. Info from Wikipedia. BG Flag by https://pixabay.com. States and game code by Ogo Bob. How to play Bulgaria Puzzle. You recieve one framed puzzle piece, representing one Bulgarian province, to place it on the blank Bulgaria map. Begin to drag the province and the frame will be removed. If dropped in the correct place the region becomes colored and next puzlle piece will appear in the frame. Do this for all 28 arrangeable provinces to win the game. Know the provinces of Bulgaria and get +1 Knowledge Level. Explore, learn, and study Bulgaria with this interactive BG map. Bordering Romania to the north, serbia and Macedonia to the west, Greece and Turkey to the south and the Black Sea to the east, Bulgaria is the 103rd largest country in the world. The largest city, which is also the capital of Bulgaria is Sofia. The official language is Bulgarian and the official script is Cyrillic. The second most common language is English. After 1989, the Government is Unitary parliamentary republic, followed by 40 years of communism. Bulgaria Total area is 111 square kilometres with 2.16% water. The population is approximately 7 million souls, where you can see 64 people in a square kilometre. The teacher's salary in Bulgaria is 260$ and the nurse's pension is 170$, making it the poorest country in Eropean Union. Driving side is left. There are 28 provinces, called oblasti, represented by the largest city in the region. How many provinces do Bulgaria have? Which is the biggest province ins Bulgaria? What are the flags and coats of arms of Bulgarian regions?